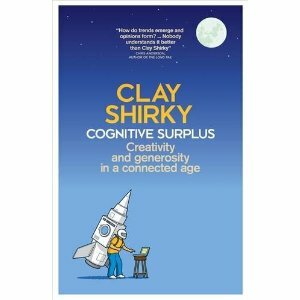 I've just finished Clay Shirkeys latest, Cognitive Surplus. Overall, it wasn't too bad - I've seen a couple of his video's on the topic (and him talk about it live - I'm just to the right, front row, just off camera), so I know the core ideas quite well, and to be honest, this killed the book for me. To various degrees, these have the same problem: They could have been a 100 page book, if it wasn't for the publishers wanting more "paper on the shelf". **All of those books could have been substantially shorter, without losing any important content. **That way it would take me less time to read them, less paper to print them (think of the treeeeeeees! ), less shelf space, and I'd be happier about the whole process. Maybe I need to buy the condensed versions or something. But I'm sick of getting a 250 page book, to find it grinding at about page 100-150, and the last 100-150 pages being a total waste of my time - just rehashing the first part, with new examples. Gladwell is especially bad at that. At least the 37signals chaps were honest about it! Seth Godin is a good anti-example of this: his books are usually short (100-150 pages), small (physically smaller than normal), and don't have this problem. Might have to grab one for the flight back to NZ.